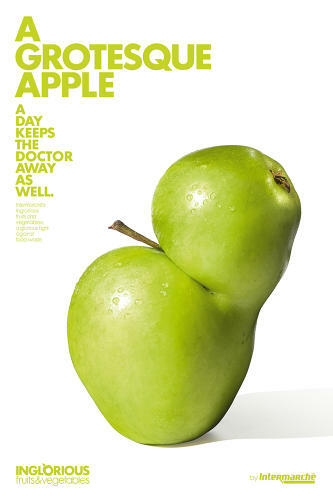 How many times have you put back an apple or a cucumber because it wasn’t perfect? Probably never, because most consumers never see the misshapen fruit and vegetables unless they shop at a farmer’s market or grow it themselves. It’s not that this produce tastes any different; it’s just not as aesthetically pleasing. We’ve been taught as consumers that carrots are orange and shaped like a long triangle (or small two inch nubs in snack-sized pages of 20) and apples are perfectly symmetrical. If you’ve ever grown carrots in your garden, you know that it’s rare for carrots to turn out symmetrical and perfect. Instead they grow long and gangly like a witch’s gnarled fingers from your favorite fairy tale. And apples aren’t perfect either. Give imperfect produce a chance. Poster by photographer Patrice de Villiers. 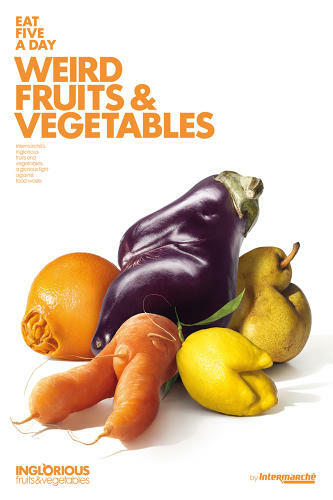 That’s why I was super stoked to see this article in Fast Company online this morning about the French grocer, Intermarche, commissioning posters of imperfect fruit and vegetables for its campaign to reduce food waste. A ridiculous amount of food is wasted every year, and while some of the blame lays at the feet of consumers (We’ve all purchased more produce than we could eat and had to throw it away when it went bad), much of the blame is on merchants and others who toss fruits and vegetables deemed not attractive enough to sell. 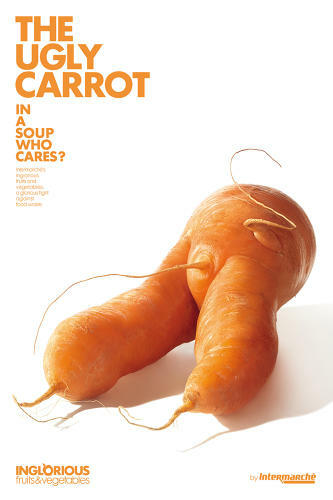 We’ve become so conditioned to expect perfection from our produce that they don’t think that we’ll purchase a wonky carrot. Maybe they’re right; I’m sure there are folks who’d say, “Ewww, I won’t let that funky-looking carrot or lopsided apple anywhere near me” as they then proceed to huck five packages of Hot Pockets in their shopping cart. And that’s okay. You’ll always have people who are driven by appearance. 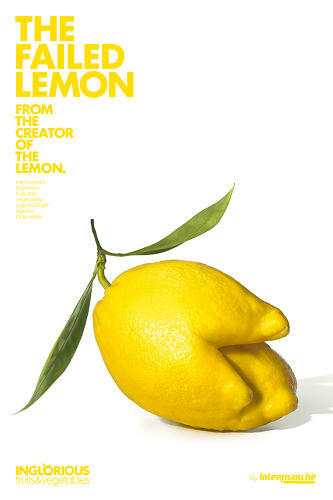 However, check out these fun posters created by photographer Patrice de Villiers, as well as his other work at the link (warning: don’t view on an empty stomach). PreviousWhat’s going on in the garden?